As a teacher, discovering that students have or are cheating on assignments and tests is so frustrating. How will we ever know what they actually can do if they're cheating?! 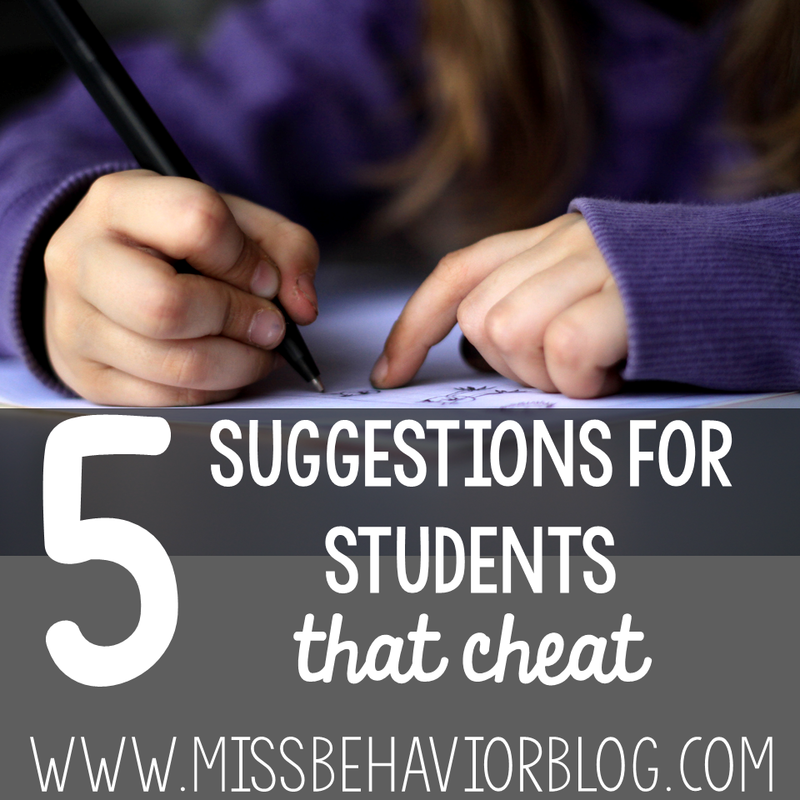 Here's 5 suggestions to tackle this important and common issue in our classrooms. Research, and quite honestly common sense, tells us that we are more invested in our work when it is meaningful to us and we are invested in it. Is that the case with your students? Take some time and look over the homework, assignments, and assessments you are giving to your students: are they all multiple choice, repetitive sheets that require no emotional investment? If a child who loves art is asked to draw their response to a book chapter, don't you think they're more likely to do the assignment themselves, do it well, and be proud to show it off tomorrow? If students are taught about, and praised for, honesty and integrity directly, they then have the background knowledge and the concept of these loaded words in their repertoire. Us adults often assume that children know and understand these big words, and understand the repercussions of not acting as such, and not every student actually has that understanding without direct instruction. If you make it explicit, and teach it in the way you'd teach any skill, you can at least count on their understanding if it's not shown in your setting. When kids are pressured, they cheat! Plain and simple. Stress does incredible things to the brain, including making a child who could ace a test in their sleep feel like they have no idea what's going on. When we make test scores and grades the "end all, be all" of school, kids result to cheating to help them get a leg up. Knowing student learning styles is one thing, and if you're a special educator, you're likely a master at this! But, often our students with IEPs aren't by our side under our direct instruction all day, as we want to our students to flourish in less restrictive environments, too. Help all of the providers on your student's team understand their learning preferences and HONOR THEM. If a child does not respond well to multiple choice tests, work with the teacher testing them to accommodate this for the child. Kids are WAY more likely to sneak a peek of their neighbors work if their learning styles aren't taken into consideration. Cheating is a slippery slope and not one we want to go down, but when you freak out, things just continue sliding. Cheating is a behavior like any other behavior you would address, and has a root cause. Find it! Is the student acting on impulse? Lacking confidence? Not responding to the format of the task? Not invested? All of that? What is it?! Have a conversation with the child in a way that shows care as the driving force, and with some problem solving, I am confident that it's a behavior that can be addressed quickly. How do you address cheating in your setting? Comment below!